Denver Home Depot Sales Inspected For Terrorism Clues Officials say FBI agents are visiting Home Depot stores in the Denver area in search of leads on some suspects who may have purchased chemicals used to make explosives. The visits are part of a larger U.S. terrorism investigation that led to raids — but no arrests — earlier this week. Federal agents stand outside the apartment building where Najibullah Zazi lives in suburban Denver on Wednesday. Zazi's apartment was searched as part of what law enforcement officials say is one of the most sensitive U.S. terrorism investigations in years. Officials tell NPR that FBI agents are visiting Home Depot stores in the Denver area, looking for leads on some suspects who might have purchased chemicals used to make explosives. The store drop-bys are part of a larger U.S. terrorism investigation that some officials have described as the most sensitive the U.S. has conducted in years. The case broke out in the open earlier this week, when dozens of FBI officials in full combat gear descended on three apartment buildings in the Flushing neighborhood of Queens, New York. The seriousness of the operation in Queens was underscored not just by the number of agents there, but also by the fact that the head of the FBI's office in New York, Joe Demarest, was on the scene personally directing the searches. Agents expected to find bomb components — chemicals or timers or fuses. Instead, they turned up a frightened Muslim family and a bomb-making manual. The key suspect they hoped to grab had already left. That key suspect is an airport shuttle driver from Denver named Najibullah Zazi. He is 24, from Afghanistan, and apparently has been under surveillance by the FBI for some time. 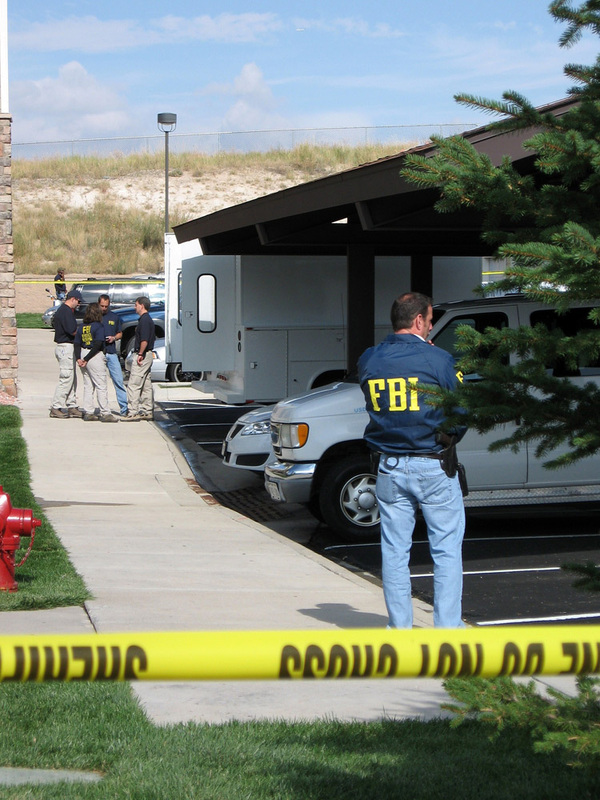 More than two dozen FBI agents descended on his apartment in Aurora, Colo., Wednesday, searching for evidence. Zazi voluntarily visited the FBI office in Denver on Wednesday in an effort to clear his name. Armstrong Graham, a lawyer with the firm representing Zazi, was present at the meeting. Graham says that Zazi spoke with officials for eight hours and gave them DNA, fingerprint and handwriting samples. He was asked about his trip to New York City, his recent trip to Pakistan, and friends and associates. He was not arrested. Law enforcement officials suspect Zazi of recruiting fellow Afghans for possible attacks in the United States. "This gentleman has lived in the United States for years, has never had any entanglements with the law; [there's] never been any questioning of him, so at this point in time, we just categorically deny that," his lawyer, Art Folsom, told NPR. Zazi was born in Afghanistan. His wife lives in the Peshawar area of Pakistan, and he went to visit her recently. His father and aunt live near him in Aurora, Colo.
Zazi is eligible to apply for citizenship in a month, and his lawyer said he plans to do so. Law enforcement officials say this case was so worrisome because the men involved looked as if they could put together a credible attack. Officials said they seemed to have some training in explosives. They were very careful about what they said on the phone and in e-mails. And that combination is what made agents take the case so seriously. On Capitol Hill on Wednesday, New York Sen. Charles Schumer tried to soothe jangled New York nerves during a hearing with FBI Director Robert Mueller. "Here's the one question I have: Could you assure New Yorkers and the American public that the situation is under sufficient control and there is no imminent danger to their safety?" he asked the director. "I can say I do not believe there is any imminent danger from that particular investigation," Mueller replied. According to one former law enforcement official, this investigation appears to be the first time since the attacks of Sept. 11, 2001, that the FBI was tracking a cluster of people who might have had all the tools they needed to launch a terrorist operation in this country. But there were no arrests, and no bomb components were found, so the big question is why law enforcement moved in when it did. "In a situation like this, the primary mission is to ascertain what is going on. You want to know the who, what, when, why and the where," said Peter Ahearn, the FBI's special agent in charge during a similar case in Lackawanna, N.Y., in 2001. "It is a pretty delicate balance, and making that decision really comes down to whether or not you really think you have a real threat, where the group or the person has the ability, the capability to act on that threat and you're going to have to take action." In this week's case, understanding why officials moved when they did depends on whom you ask. New York police say that with a presidential visit to the city and the upcoming U.N. General Assembly session, they couldn't afford to risk anything's going wrong. Privately, FBI officials say that they wanted to wait and track the group longer. Zazi's lawyer says neither the FBI nor any other law enforcement agency has filed any charges against his client.